MSF ASWIJA & Adrienne Norman MSF ASWIJA had a bay filly in April 2006. GOOD LUCK IN FUTURE Desert Arabian breedings! MSF Rais is a blend of Al Khamsa bloodlines in Egyptian plus tail female *WADDUDA tracing to Homer Davenport's imports in 1906. MSF Rais' dam, HART ASHEERA is a winning performance mare in many divisions, including 1996 winner of Competitive Trail with a perfect score, while 7 months pregnant with MSF Rais. Hart Asheeera was also distinguished in being inspected (2001), and accepted into the AMERICAN TRAKEHNER ASSOCIATION studbook, as a producer of PUREBRED TRAKEHNER Warmbloods. Look for them in AHA, Open and Eastern Amateur Arabian Shows in the future. IMFBadia Nafila's damline is in danger of extinction within the Al Khamsa Arabian horse group. 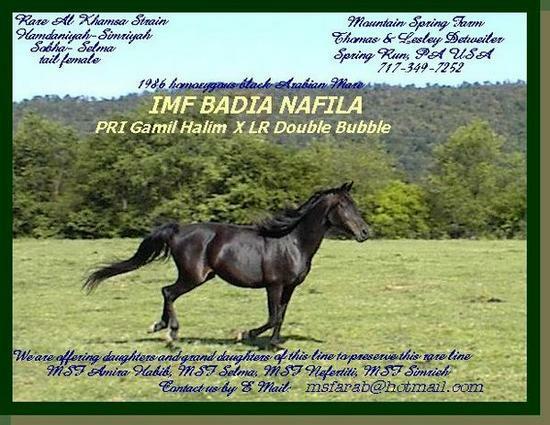 We congratulate Pamela on her purchase, and hope to see more foals from Nafila in the future. We sold Nafila in foal to the Straight Babson Egyptian stallion, BW Fadl Tali (Faydin x Bint Fadl Starr) and she delivered another replacement Bay filly in April 2006, MSF SUNDAY. CONGRATULATIONS! Nafila turned 20 this year, and delivered her 11th foal without assistance. Congratulations to Dorothy Muncee on their purchase of MSF SUNDAY in utero! What a great start in Egyptian Sired Desert Arabians! We also are offering several select purebred fillies & two black colts who are very rare within their Egyptian breeding group of the almost extinct strain of Hamdaniyah Simriyah tracing to the ABBAS PASHA mare, SELMA I ( 1854). This tail female line has been shown successfully in Sport Horse in Hand class. See our Bedouin Strain page & the COLTS page. Kamar is a beautiful blend of Al Khamsa rare bloodlines in both Egyptian and Sa'ud (King Ibn Sa'ud) breeding groups. He has the rare tail male line tracing to the Egyptian (EAO) USA 1958 import, *Soufian, which is not found in many Al Khamsa Egyptian horses. Kamar's dam, MSF Shamis, is also one of the rare daughters of LD Rubic, carrying the only Al Khamsa tail female bloodlines of the imported mare *Nufoud, also bred by King Ibn Sa'ud. Kamar has the distinct character of both of our foundation Al Khamsa stallions, Kahream & MSF Sheikh Habib. 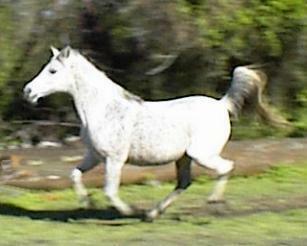 He is a rare chestnut roan color and REGISTERED as a roan. His eye is large with a wide forehead and underjaw for breathing capability for distance work. He is standing at Stud at HUSAANA ARABIANS< in NEW TRIPOLI, PA.
Kamar has gone to join JDA Husaana, MSF Noel, and MSF Karima with Monica Flynn. He is just beginning to bloom as a young stallion as well as in his training under saddle. Kamar has a wonderful attitude and is very quick to learn. We were so pleased to see him go to a wonderful home, as he exemplifies qualities of Sheikh and Kahream and the COMBINED SOURCE AL KHAMSA ARABIAN. He stands at stud for outside mares. To date he has been producuing well balanced Al Khamsa Arabians, and wishes to service more mares, so please ask about him from us or look up Monica & Patrick Respet in the Arabian Horse World magaizine AL KHAIMA insert in the July 2006 issue. MSF Noel AHR 513403 is a BLACK LIVER CHESTNUT "COMBINED SOURCE" Al Khamsa Arabian containing the famous Hallany Mistanny AHR 1315 through Mistlany and Julyan, and tracing to ZARIEFA in tail female. Monica has become a wonderful client as well as great friend to MSF. Monica was careful in her selection of horses and are a part of the wonderful blend of blood Monica is preserving. Monica and her riding students are pleased with Noel's skills under saddle as well as her sweet disposition. Also joining Monica is MSF Karima. A sweet youngster and half sister to JDA Husaana a favorite of Monica's. Monica's students, especially Nicole, were very glad to have Karima join them. :) AL Khamsa Egyptian Desert filly. Tail female to *Urfah, imported in 1906 from the Desert by Homer Davenport, reclassified as a Saqlawiyah-Al-Abd in strain. This is a high Egyptian Al Khamsa Arabian with one of the only crosses left in Al Khamsa breeding to the Sirecho(*Nasr x Exochorda) son JORAMIR. Joramir was so popular as a winning stallion that he was not used in preservation Al Khamsa breeding groups but for a few breedings. She is going to be tall, and another excellent representative of Kahream's offspring. She had a lovely 2005 AEP Kamar fillyl, adding to the Al Khamsa Rare Element group of Arabians. Salil's dam line, *NUFOUD, bred by King Ibn Sa'ud, is in danger of extinction within the Al Khamsa Arabian horse group. Salil Ibn Iliad is a Blue List Al Khamsa Arabian. He is the RICH blood bay color with iridescent sheen floating across his coat. Salil also carries *Turfa in the damline, whose breeding is well preserved within Al Khamsa. Both *Turfa & *Nufoud were bred by King Ibn Sa'ud. This tail female line has been reduced to Salil's dam, LD Rubic, and her daughters. Salil has produced several rare Al Khamsa foals. He is trained in western pleasure with NATURAL carriage and smooth gaits. Al Khamsa, Blue List foals are available. Salil is currently standing at stud in Myrtle Beach, South Carolina, at Japaa Desertbred Arabians. Visitors fall in love with his sweet personality and quiet disposition. Rhiannon CHF AHR 453225 has been producing beautiful babies with Salil in Myrtle Beach, SC at JaPaa Arabians with Pam, after producing excellent foals at MSF. Rhia has beautiful movement and carriage which she passes on to her babies. 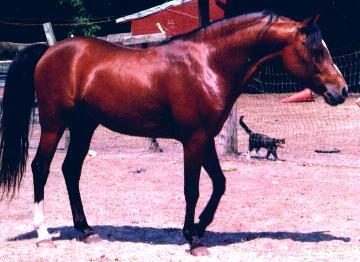 This mare is representative of the fine Arabians produced combining Desert and Egyptian blood, called Combined Source. Pam also uses Rhia for riding lessons and beach riding when she isn't heavy in foal. Blue List foals from Salil x Rhiannon are available to start your Al Khamsa Blue List Program.